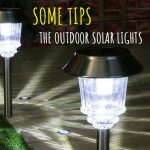 Most of the solar lights out there are made and designed so that they take challenging weather conditions so you don’t need to worry much about their safety when left outside. The market gives you though solar lights that aren’t designed for the rain or to handle the elements very well, in which case you need to think about protecting them and storing them accordingly once fall or winter have come. Let’s take a look of the main categories of solar lights out there and see what you can and should do in order to extend their life span. This type of lights is usually a bit more fragile, unable to go safely through the winter. They are working nice and easy as long as the solar panel doesn’t get all covered up by the falling leaves, ice, snow or debris. This applies especially in the case of solar lamps, floodlights, and spotlights. Typically, the price is a good way to tell if your solar lights are going to serve you for more than just one season or not. The more you’re paying, the higher the chances for the solar lights to be more durable, though. 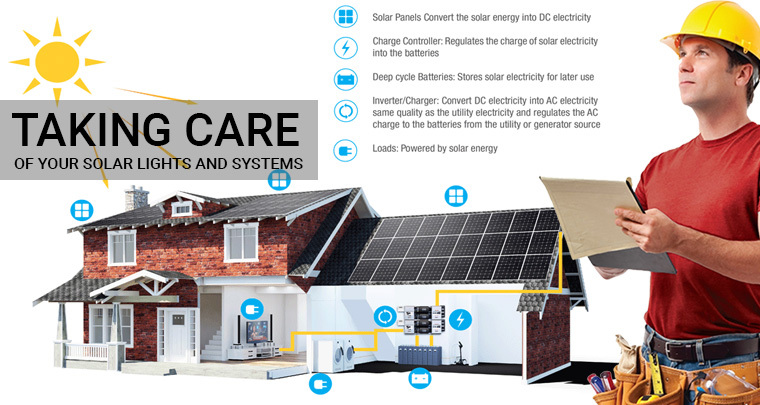 A stronger material, a better design, the housing that protects the wiring, and the controllers are things that count and the higher their quality, the more durable your solar lights are going to be. On the other hand, many decorative lights are lightweight since they’re made with thin glass or composite materials, which explains their poor performance once the temperature drops for the winter. Let’s not forget that you want some gazing balls so that everyone may enjoy the design in your garden and once winter has come, not many of you spend a lot of time outdoors. As many accent lights (spotlights also) are close to the ground, even if they’re made with durable materials, you’re still not going to be able to protect them from rakes or leaf blowers, not to mention the snow in the winter. If you’re using some solar fountain you know that you may get models that also include bird baths and only the ones made of metal or wood may take the sub-freezing temperatures. If you’re using some solar décor items that are made of plastic/ceramic/glass or composite materials, chances are they may crack or break from the expansion of freezing water. The pump of the fountain may also suffer, even though it’s inside. You shouldn’t worry about a thin sheet of surface ice though, but deep cold weather instead. In the case of pond pumps, the situation isn’t any easier. Let’s say that the pump is deep so you don’t need to worry about ice, but there are the batteries, solar panel and the control units to think about. Let’s not forget that many pumps use batteries that perform poorly in cold temperatures, so the pumps may not work because of that during cold weather. Keep in mind that Li-Io and Li-Ph. batteries may work better in cold days. Take a look at the wiring too as even a small amount of frozen water may damage the fragile wires inside the pumps or the exposed controllers. Bring inside your house any solar pest control or units that spray water/placed in water for the winter. If you’re using some devices with rotating parts, don’t leave them outside for the winter either. When a rotating blade is frozen stuck by ice, the risk for the motor to burn out is quite high. When you’re using solar appliances or solar lights, as long as there is sun, ice should be at bay, therefore you shouldn’t worry about them cracking or dying. If you don’t want to get inside the house your solar devices, you can also turn the “off’ position until spring. If you want to keep it on the safe side, it’s always better to store all your solar pumps and fountains for the winter time. In case you’re thinking about storing your solar pumps/fountains over the winter, there are some tips and steps you need to consider. It’s essential to rinse off dust, pollen, plant debris, leaves or bird dropping before you get to store your solar pumps/fountains. 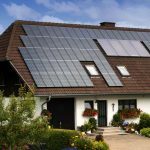 You don’t want to damage the finish nor the housing of the solar panels. After all, it’s so difficult to clean things once the gunk has dried. Double check so that all the parts are dry before storing them away. Remove the pumps out of the water and leave them in the sun throughout the day so no inner parts are moist prior storing. Many of batteries out there are going to leak when not in use which is why it’s essential to minimize risk for damage caused by the leaking chemicals. Some batteries don’t present this risk, but why take that chance? After all, do you really want to buy a new solar fountain or get some new, way cheaper batteries instead? Once you removed all batteries (considering that you can do it), it’s best to store them in an envelope with their name on the envelope. It’s going to be easier for you in the spring to know which goes where. Where you’re going to store your solar pump/fountain is also important as it’s useless to store the panel, the pump and controller units in a dark, unheated shed. You may found them all damaged in the spring. Unless your basement doesn’t present too much dampness, you can totally go with it. Shed and attics are also a good choice, but garages make the better choice, as long as the temperature isn’t too low. Keep in mind that an attic may also get quite hot in the winter. Do you want a tip? You know that a storage area is good for the winter if a plant may survive in there for more than a few days. It’s time to clean up your garden! What about your solar outdoor lights while doing it? Even if you don’t have a cold, snowy winter, you still have fall coming ahead and you need to clean up your garden. But what to do with your solar lights while cleaning up from the leaves? Make visible or the solar lights that you can’t move. You may tie a bright, colorful ribbon or a strip of tape to the décor lighting so you can safely clean up the area around them. Have a general idea about where are placed all of your solar lighting that you can’t remove away when cleaning. Look up for the small pebbles, small sticks or acorn that may become highly dangerous once they’re thrown into the air by blowers or a fast rake. Don’t forget to cover your fixed solar lights and solar panels with some padding before you’re using the blowers and rakes. Get creative and use some pillows, old blankets or comforters for protection. If you’re planning to use your solar lights, pumps or fountains next spring too, you need to store them away for the winter or get some that handle the cold temperatures. It’s up to you and your budget.